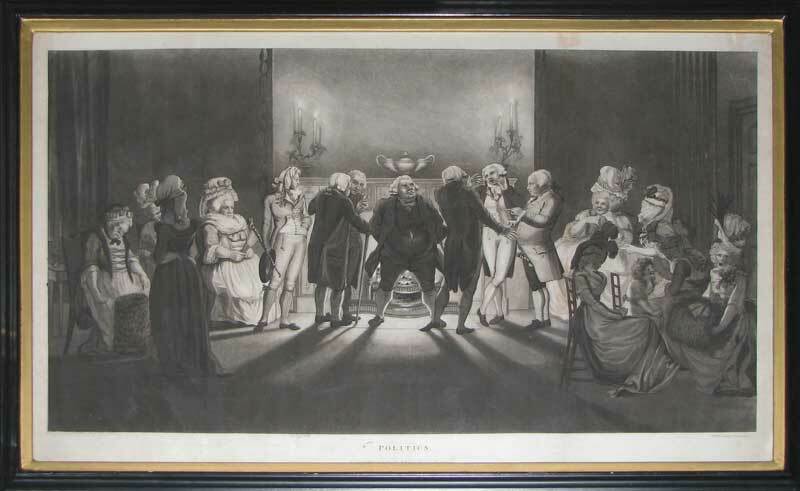 The plate depicts Dr. Johnson standing with his back to the fire holding forth to the assembled company. To his right stands Sir Joshua Reynolds and on his left are Richard Sheridan, facing the front, and the playwright Oliver Goldsmith. The gentlemen are giving their opinions on the political issues of the day whilst on the periphery the ladies are either gossiping amongst themselves or gently falling asleep. The imposing lady to the left of the scene, seated and holding a fan, is the socialite and champion of the bluestockings, Mrs. Thrale. Robert Pollard (1755-1838) was an aquatint and line engraver of naval, military, sporting and decorative subjects after his contemporaries. This plate is unusual in that he has engraved after his own work. He was born in Newcastle but came to London in 1774. By 1781 he had set up his own publishing business in Islington employing a variety of people to perform the aquatinting of the plates.